A youth group of the Russian Orthodox Church Outside of Russia returned from St Petersburg after participating in the International St Tatiana Youth Meetings held on January 22-26, coinciding with the feast day of that saint. The Deputy Chairman of the Synodal Youth Department, Protopriest Andrei Sommer, shared his impressions of the event. - Fr Andrei, the foundation for this event was a “telebridge” held on May 2 of last year, when the leaders of the youth organization “Pokrov” invited you and a group of young Americans to a symposium to discuss youth programs during St Tatiana’s Day in St Petersburg. The trip promised to be interesting from the spiritual-education point of view and in terms of learning about Russia. Were these expectation met? - I have many wonderful memories. The International St Tatiana’s Youth Meetings were held with the blessing of His Holiness Patriarch Kirill of Moscow and All Russia and scheduled to coincide with Russia’s Students’ Day. On the Russian side there were representatives of Orthodox youth organizations, Orthodox brotherhoods and student councils from the leading institutions of higher learning in the country. This year, a group of young people from the US participated for the first time. These were 12 people active in Orthodox communities from the Eastern-American and Western-American Dioceses of the US. We formed the group so that most of the young men and women would be descendants of Russian émigrés of the first half of the last century who had never been to Russia. In fact, their parents had never been to Russia, either. So for them, a trip to St Petersburg became a rediscovery of the homeland of their ancestors. Preparations began last summer. Our trip was blessed by His Eminence Metropolitan Hilarion, First Hierarch of the Russian Orthodox Church Outside of Russia, and a great deal of support was granted by His Grace Bishop Amvrosy of Gatchina, Rector of St Petersburg Theological Academy. 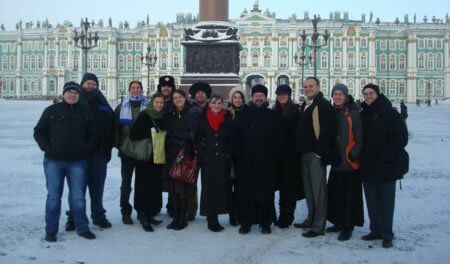 On opening day of the Meetings, held at St Petersburg State University of Economics and Finance, a symposium was held to exchange experiences in Orthodox youth ministry in Russia and the US. I must say that at first, the Russian students were somewhat skeptical about our youth—what could these Americans possibly teach them? But when our young men and women began to talk about their lives and participation in parish life, this attitude changed. Six of our representatives spoke at the symposium: Nicholas Collaso and Larisa Krassovsky, parishioners of Joy of All Who Sorrow Cathedral in the Western America Diocese, who shared their experience at scout organizations. Alexandra Kotar talked about the persona of St John of Shanghai and the importance of Orthodox education in today’s world. Ekaterina Rimakis, teacher of the foundations of Russian Culture from Lakewood, NJ, emphasized the work of the Youth Committee of the Eastern American Diocese. The Russian students learned many interesting things about the practice of organizing Orthodox pilgrimages in the Church Abroad. In particular, Katerina Ivask talked about one of the most memorable of these, “In the Footsteps of Moses.” Timothy Henderson talked about a time-tested annual event, the St Herman’s Youth Conferences. Gregory Soloviev concentrated on missionary work, and also spoke about how young people help build a new church in the capital of New York State. So gradually the attitude changed of the Russians towards our youth, who live among non-Orthodox, who speak Russian at various levels of proficiency, yet who live with faith in their hearts and faith in the Church, and preserve the traditions of their ancestors. For these people are united not by citizenship, not by the country they live in, but the Russian spiritual tradition, common roots. It was good to hear how the Russians told our youth that they preserved the Orthodox faith and culture even more than did they, who lived in the homeland. - Yes, of course. During our sojourn in the Northern Capital, we stayed at the Theological Academy with the blessing of its Rector, and attended the Academy’s St John the Theologian Church, and some of our pilgrims partook of the Holy Gifts, and even attended a wedding performed by the Rector, Bishop Amvrosy. On the feast day of St Tatiana itself, January 25, we prayed at Divine Liturgy at the magnificent St Isaac’s Cathedral. Vladyka Amvrosy, the Rector of the St Petersburg Theological Schools, officiated, joined by 25 priests, and I was fortunate to be among them. During the divine service, which included singing by several choirs, including the Academy Choir, the members of the Academy and other seminaries prayed, the directors and teachers of the St Petersburg higher educational institutions and a multitude of students, including those of St Petersburg’s military academies, and many also communed of the Holy Mysteries of Christ. At the end of Liturgy, a festive moleben was performed, and the representatives of Orthodox youth of both countries and their teachers were given Honorary Medals of St Tatiana. This medal was established in 1997 by the Council of Rectors of the Higher Educational Institutions of St Petersburg, by the St Petersburg Diocese and the Theological Academy. The medal of St Tatiana is awarded in recognition of social and missionary work. Fifty people were awarded a version of this medal that day. Everyone in our group received one from the hands of Vladyka Amvrosy himself. We also visited sites that are venerated not only by Orthodox Christians in Russia but abroad as well, places tied to the life and memory of St John of Kronstadt and St Xenia the Blessed of St Petersburg—St John Stavropighial Convent and the Chapel of St Xenia at Smolensky Cemetery. - Fr Andrei, tell us about another interesting event in which your group took part; to wit, Tatiana Ball. - The tradition of hosting formal balls in only now being reborn, while in Orthodox communities in the USA, it has been carefully preserved for several generations. This wintertime students’ ball is organized at the initiative of “Pokrov” Inter-University Association. Its goal is to create a fertile, festive arena to unite today’s youth, and also to restore the traditional culture and ethics of such socializing. A dress code was set for all the participants: a suit or tuxedo for young men, and evening gown for young women. The ball was thrown in one of the most beautiful halls of St Petersburg—the Bolshoy Hall of the Academy of Industrial Arts. Orchestra music was played, singers performed, there were musical competitions, surprises, and of course classical dancing. Members of the youth from other dioceses are invited to this ball, which is especially popular among the youth of St Petersburg. This was the first year that young people from abroad participated. So this was our trip. The weather in St Petersburg was very cold, but compensating for it was the warmth which our hosts displayed, and all the activities we were fortunate enough to take part in. We are especially thankful to Vladyka Amvrosy for the role he played, and for his warm greeting. On the way home, our young men and women kept repeating that they left their hearts in St Petersburg. I am very happy for them. I am happy how much spiritual experience and personal contact they had during the trip, and also for the fact that their meeting with their historic homeland did not disappoint them. I would like to note that our participation in the International St Tatiana Youth Meetings was made possible thanks to the Fund for Assistance to the Russian Orthodox Church Outside of Russia, to whom we are very grateful.